If there's one word that's taboo among figure collectors, it would be "E-X-C-L-U-S-I-V-E"
There's just too many excellent figures with an "exclusive" label slapped on it, with an "exclusive" price tag to go with it. There are times I wished I just lived "there" because of these things, but I'll have to wait patiently for that opportunity. The bootleg of interest today would be the Comptiq version of Konata. 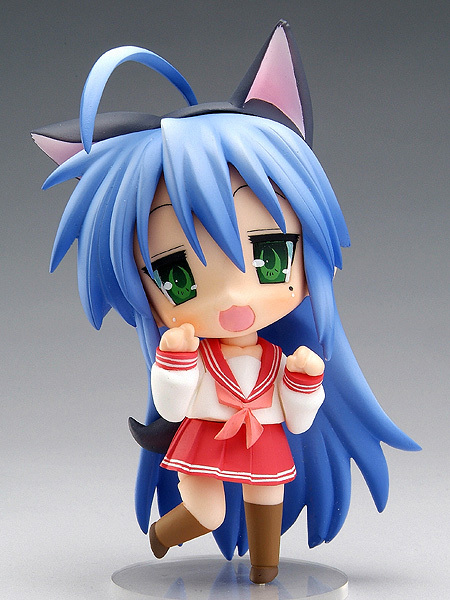 Among the 3 different nendoroids of Konata (Comptiq, Chara-Ani & LS website versions), this version is the most tempting among collectors, with moe kitsune-mimi, for an absurdly high price. Even more so for the pirates to simmons. I would love to get the "Comptiq + Saitama Exclusive" (comes with Saitama newspaper), but maybe when I have a little extra cash to burn, and hopefully in time before the supplier's stock runs dry. The usual modus operandi of pirates; leaving out the stickers, which I suspect, are beneath their reproducing capabilities. The genuine carries a stamp from Kadokawa, while the counterfeits, as usual, have a replacement or none at all. But there are a few bootlegs which carry "Kadokawa" stickers as well, so please take note. As you can see, the genuine has the word ”ぷち” (puchi), much thicker/bolder than the counterfeit. Looking back-and-forth from both boxes, the genuine certainly has a much more subtle colour contrast, with the counterfeit's further darkening the already dark parts. Apart from the light-reflection-from-bootleg, the colour on Konata's blue hair has been faded way over the proper gradient. Either she's growing older and sprouting white hair, or someone accidentally dropped her in bleach. However, the colours are very much spot on. I could not find the official page for this version, but the Saitama exclusive lives here, and more images of the nendoron here. Although, there are other variations of counterfeits, so this is only a guide to watch out as bootlegs might get harder to distinguish from the original.